A cool guy named Adam Reynolds used the Lost Punx and put together an awesome Lost wallpaper that I'd like to share with y'all. I was especially impressed with the Simpsons house 'ruins' he added in there. P.S. More new posts coming for SP this next week! It's incredibly sad that the Huffington Post is giving him credit for the whole "simpsonizing" of the cast. Shame on them! Very cool site, man. Love the comics characters in the b.g. Cool! Carlton Cuse tweeted that he liked this. Hey, that is cool indeed. Thanks 'May the best man win'! That is awesome that Carlton Cuse has tweeted it!! Thanks for putting this up on your blog Dean! I'm Adam Reynolds by the way. I'm impressed how you really do capture the individual characters well. Kudos! 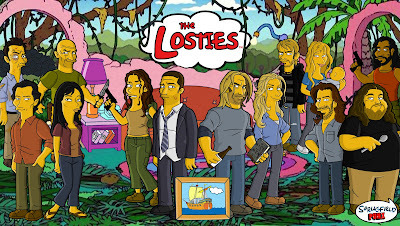 But the title should have been "The Lost-ones" not "The Losties". I think it's a better play on Simpsons. You shoul'd have done the cloud in black! have you done a set for "ugly betty" yet? how about "desperate housewives?" This is awesome. I'm so setting this as my wallpaper. Adam is definitely a talented artist.